Sea Shadow was a test craft developed under a combined program by the Defense Advanced Research Projects Agency (DARPA), the U.S. Navy, and Lockheed Missiles and Space Company (LMSC). Its purpose was to explore a variety of new technologies for military surface ships, these included automated ship control, Small Waterplane Area Twin Hull (SWATH) advantages, automation for reduced manning, rough weather seakeeping improvements with stabilizer and canard, and radar and sonar signature control. She was later used as a test platform for advanced combat systems prototypes that emphasized passive (no active radar) identification and targeting. She was always a test platform and never armed as a combatant. 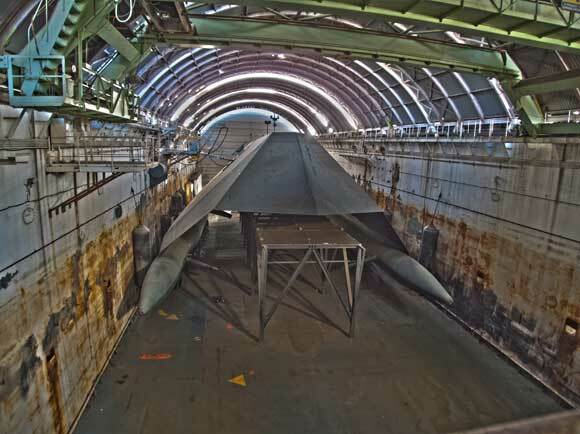 To keep Sea Shadow out of the public eye, she was built inside HMB-1 and delivered in March of 1985. Night tests were conducted in 1985 and 1986 off the Santa Cruz Islands in Southern California with the barge keeping the ship under cover for repairs and replenishment during daylight. The tests were suspended in 1986 and not resumed until spring 1993 when the ship was unveiled for the first time to the public. In late 1994 the testing concluded in the San Francisco Bay, and the Sea Shadow and Hughes Mining Barge 1 were moved to San Diego and were docked at the 32nd Street pier. In May of 1999 she was reactivated for additional testing. She cost approximately $50 million to build and the total test program was approximately $195 million until she was stricken in 2006. The Hughes Mining Barge 1, or HMB-1, is a uniquely designed submersible barge. She was originally built in 1973 as part of Project Azorian (a subset of Project Jennifer), the top-secret effort by the Central Intelligence Agency to salvage the remains of Soviet submarine K-129 from the ocean floor. HMB-1 was designed to be submerged under the Glomar Explorer to secretely load the large claw device that grappled the submarine (capture vehicle), and to conceal the recovered submarine. In many ways her tank structure is more similiar to a submarine than a normal floating drydock. More Information on Glomar Explorer and how HMB-1 was designed to load Glomar Explorer. After the conclusion of Project Azorian, HMB-1 was cleaned and then stored at the Todd Shipyard in San Francisco, CA until November, 1982. 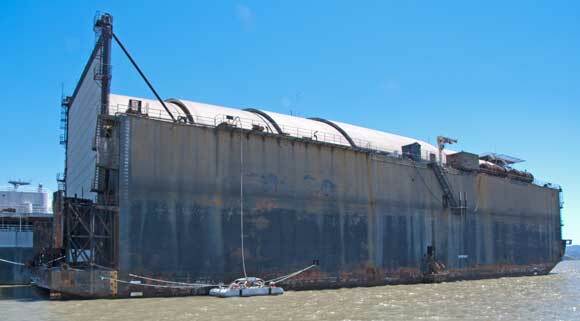 She was then towed to a LMSC facility in Redwood City, CA, where she was significantly modified to become the floating drydock for the construction and operations of the Sea Shadow. Upon completion of Sea Shadow operations in 2006, HMB-1 and Sea Shadow were moved to the Susuin Bay Reserve Fleet for storage. In 2012 HMB-1 with Sea Shadow still inside was sold to Bay Ship and Yacht in Alameda, CA. They dismantled Sea Shadow and are using HMB-1 as a working ship repair drydock. Help for pano image display problems. Copyright © 2011-2013, Historic Naval Ships Association.